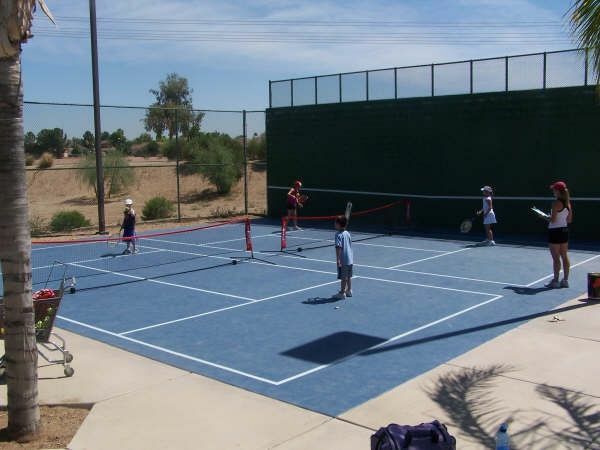 Paseo Racquet Center has added two new smaller tennis courts for junior players. These smaller scaled courts allow junior players to learn to play the game of tennis much faster. For years other sports have had smaller equipment for juniors so they have more initial success and fun and stay in the sport longer. Baseball has t-ball, Basketball has lower hoops and Soccer has shorter fields! Now tennis has adapted to the needs of juniors. Another addition is the use of foam balls and low compression balls so players can enjoy playing the game of tennis. For information on how you can enroll your junior players in the Paseo Tennis Program, contact Ed Prudhomme at 623-979-1234.